The kitchen garden is a heartless creature sometimes. This is the season for slaving away sowing, hoeing, weeding, soil improving, potting on-ing. May is when the leg work for the whole growing year is done. It’s when the foundations for a good or bad harvest are laid. And in return for all this nurturing and fretting the allotment gives you, what? As we shuffle forth reluctantly into the Hungry Gap, clutching our rumbling tums and wishing we’d never said we were sick of leeks, there is almost nothing for the average gardener to pick in May. The radishes aren’t plump, the PSB has flowered, the pea shoots aren’t podding yet and the asparagus….well, come on…. who has time to grow asparagus for themselves? What there is, is rhubarb. It’s divine at the moment – thin, pink, still sweet, not yet stringy. It is known to some that I get a bit giddy about rhubarb. You can see last year’s rhubarb rants here and my compendium of bloggers’ recipes here. It’s also one of my top 10 things to grow yourself as you can see here. So you see, I can’t get enough of it (which is fortunate when that’s all there is). Dissolve the sugar in the vinegar over a low heat whilst you chop the rhubarb. Once clear, add the rhubarb to the vinegar and sugar and simmer until just soft, about 3 minutes. Blend the mixture then pass it through a sieve to make it extra smooth. 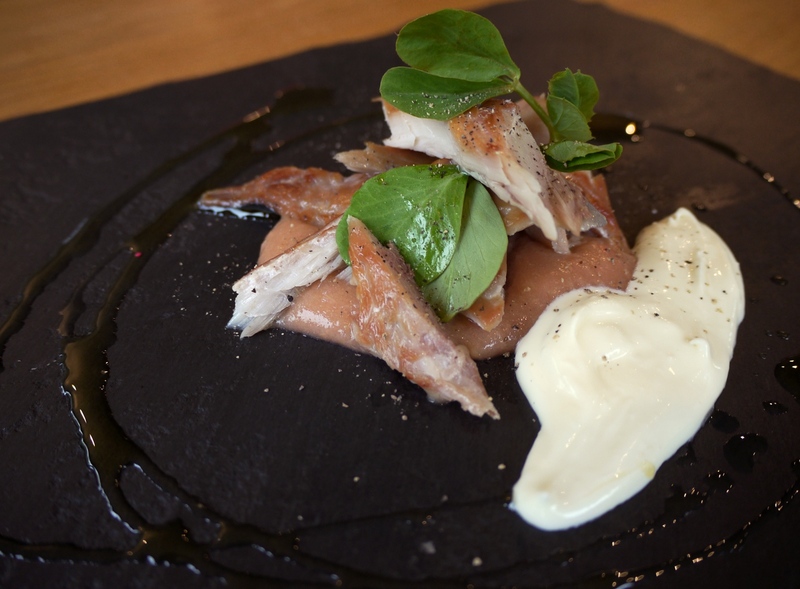 Arrange on a plate with the mackerel on top and a spoonful of creme fraiche. This would also work beautifully with sashimi mackerel if you can find it fresh enough. Or with pan-fried fillets of mackerel too. This little darling is part trifle, part crumble, part fool – hence the name. It’s basically rhubarb and custard, which can never be wrong can it? First cook the rhubarb. Chop it up and heat it in a pan with the brown sugar. On a high heat it will soften slightly in 2-3 minutes. As soon as it does, move it from the heat – we don’t want any stewed school rhubarb thank you. Next make the custard. Whisk the egg yolk and the sugar together then add 100ml of the cream. Pop it in a pan over a medium heat and cook through until it coats the back of a spoon (which the Hestons of this world could say was when it got to 74 degrees). Don’t let it boil! Cool in a chilled bowl. Whip the remaining cream to soft peaks. 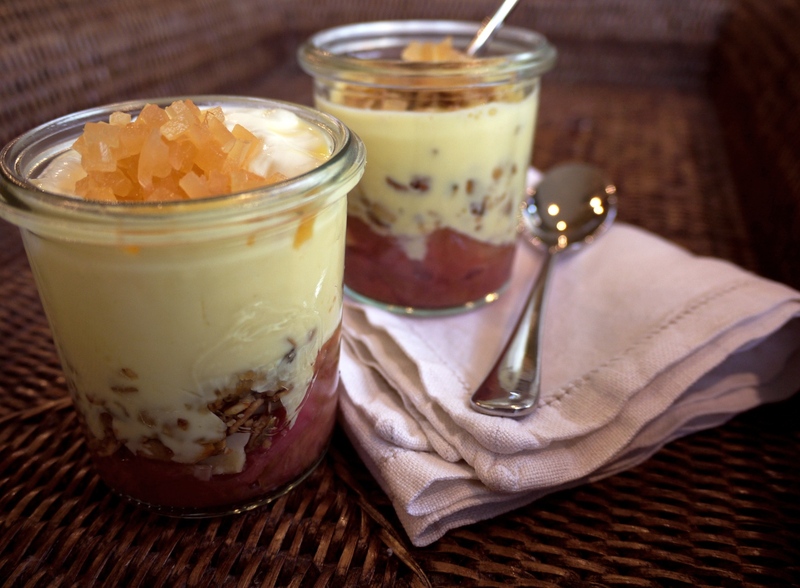 To assemble, place the rhubarb in the bottom of a glass, add a layer of granola followed by a layer of custard and a sprinkle of stem ginger. Repeat and finish with a dollop of whipped cream and a sprinkle of stem ginger then tuck in and thank heaven for rhubarb. Lovely looking recipes. Unfortunately my rhubarb is putting all its energy into producing flowers instead of stalks, so I’m left with just a hungry gap… although there are always the nettles if we get desperate. What a bore! I’m sure you know, but you can chop the flower stem off at the base if you like. I’m told you can eat the flower florets in stirfrys etc, but I’ve never tried it. And I agree, nettles may save us. At least we’ll have a decent iron intake over the hungry gap, eh?